Mayzi woke up from another painful sleep. Her neck was stiff and it felt as if she had slept on a stone bed, even though it was really a regal oak wood bed. It seemed as if there was no sleeping position that wouldn’t end up in pain. After resting for a while, just like every morning since her birthday, she rose out of bed and trudged to the mirror. She eyed herself from head to toe, the horn, wings, tail, nothing felt right to her. You see, she didn’t always look like this. 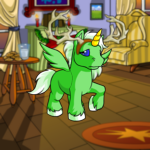 She had received a Green Uni Morphing potion for her last birthday from a rich aunt who had also morphed from her original Grundo form into a Uni. Somehow she had convinced Mayzi to drink the potion, saying life wasn’t meant to be spent as a Grundo, a symbol for Dr. Sloth. But she didn’t believe that now, and instead she was now perceived of as vain, which to her was even worse. “Good morning sister!” Sandy’s voice called from inside the doorway. “Good morning,” Mayzi replied blankly, focusing in on her heavy hooves. “Doesn’t staring at yourself every morning get tedious? Though I suppose you are a Uni now...” Sandy trailed off. 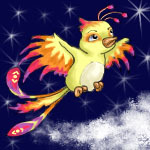 “Have you ever wondered what would happen if you woke up one day and you weren’t a Kacheek?” she inquired. Now was the time, when she finally decided to tell someone. “Well, the truth is...” Mayzi started hesitantly, “I can’t stand being a Uni. I’ve put up with it for so long, but now I know for sure that I’m not meant to live a Uni life. I want to be a Grundo again,” Mayzi said honestly. “Wow, I didn’t know you felt that way... You sound sure of yourself, so I say go ahead; go back to your original form. Though, I feel obliged to ask, how are you going to do this?” Sandy asked, walking further into the room. The walk to the Magic Shop was short since she lived in town. Mayzi positioned herself in front of the mysterious shop. Around her neck was a bag of Neopoints, her life’s savings. She pushed the door wide open. “Welcome, I house many astonishing items for all of your purposes,” Kauvara invited from inside the shop. Mayzi always enjoyed coming here. Sure, she wasn’t very interested in magic or potions, but something about the shop spoke to her. It had a high tented roof that draped majestic purple fabric from all sides. She walked up and down the rows of shelves; there were many types of potions, but no Grundo morphing potions from what she could see. After tiring of searching, she approached the shop keeper. “I’m in need of a Grundo morphing potion; do you happen to have any in stock?” Mayzi asked kindly. Oh great, thought Mayzi, if I would’ve come a few hours earlier I could’ve gotten it, but now I’ll have to travel to the Marketplace. The walk to the Marketplace was short, and once she was there it was easy to spot the Shop Wizard. There’s bound to be at least one morphing potion here, she thought. “Welcome! What may I help you look for?” said the short JubJub with a smile. He’d helped Mayzi out so many times in the past that she had learned that she could always count on him. “No,” sighed Mayzi, “that’s all I needed to look for. I’m not even going to bother going to the trading post; they’ll probably be way over my price point anyways and I don’t feel well enough to travel there.” Though Mayzi really didn’t go there for fear of being disappointed again. She thanked the kind Wizard and started making her way back home. Was she ever going to find the item she needed most to be herself? This was one of those few times when she barely noticed the shops around her, as she headed back home in Neopia Central. Sure, there would always be another chance to get the morphing potion at the Magic Shop, but it was so unpredictable when a new one would come, and it was too expensive anywhere else. I’m almost home now, she thought gloomily, and then I’m going to have to tell Sandy that I couldn’t find it... The sun shone bright as she passed the Money Tree. She squinted her eyes to try to see what was in front of her. Wait... In front of the book shop, could that be... no, of course not... Wait, it is! Mayzi sprinted to the familiar face she saw. “Aunt! Aunt!” Mayzi shouted excitedly. “Oh, Mayzi! What brings you into town?” she asked with a smile. “Good. Back when I gave you the Uni Morphing Potion I felt differently about Grundos. I was ashamed of how they were taken advantage of by Dr. Sloth, and I felt as if Unis made people think that we were strong. But I was wrong to be ashamed of something that wasn’t our fault. Now, I’m proud of our heritage, and I have had plans of becoming a Grundo again too.” She reached into her bag and pulled out a potion. “While at the Magic Shop this morning, I found this. I was going to use it on myself, but now I feel like you should take it instead.” Mayzi watched as her aunt held out a Purple Grundo Morphing Potion and placed it into her Neopoints bag. “Please don’t be guilty about taking it. I can always buy one at the Trading Post; I have the Neopoints,” she said with a wink. “You're welcome.” And with that she returned to her shopping, waving Mayzi good bye. Mayzi thought of what had just happened. Sandy would be so surprised about all of this. But, she knew something else now. You can change your appearance as much as you want, but you can’t change your heritage. Now Mayzi was truly proud to be a Grundo. "We aren't gonna do anything wrong, Tess. We're just gonna knock on the door and see if Old Lady Crimmins is really a witch like everyone says. No big deal."